Double sided handlesets, also known as grip by grip handlesets have the same full grip trim on the interior as they have on the exterior. Double sided handlesets are generally available in three functions, single cylinder, double cylinder and dummy. Single cylinder grip by grip handlesets have a turnpiece to unlock on the interior. Double cylinder sets have a keyed cylinder on both inside and outside. Dummy function grip by grip handlesets are simply matching trim with no internal locking mechanism. 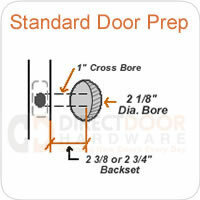 Double sided sets will fit a standard door prep and fit doors from 1-3/4" up to 3". Please contact us with any questions you may have about our grip by grip handlesets. Emtek has created a large selection for doorknobs, lever handles, handle sets, bathroom hardware, cabinet hardware and other home hardware prodcust in coordinating finishes. Their mission: "Emtek is dedicated to bringing interesting, well made hardware back into American homes... Americans are re-discovering the satisfaction that comes from owning well designed products. Emtek's mission is to make it possible for home owners to apply these higher expectations to door locks. We are striving to provide a broad, interesting range of products that consumers can use as elements of decor, not just as a way to latch a door." Take a look at the great selection of products above. Nearly all of Emtek hardware is made of solid brass for long lasting quality. Customers can choose from a wide variety and even mix finishes and styles on individual lock sets. Should you have any special needs or requirements, please let us know. All Emtek orders are assembled and shipped from City of Industry, CA. Because of the quality of the locks and their customizable nature, door knob orders are assembled at the time of the order. Please allow 3-5 days before shipment. For any specific questions about Emtek door hardware please give us a call or contact us. Emtek door hardware fits into a standard American style tubular door prep. If you are replacing existing locks then your door preps will most likely be correct for Emtek Doorknobs. Just determine the backset and you're ready to order. If you're installing locks in new doors that do not have a door prep you can follow the instructions below. Emtek knobs are shipped with square corner strike and mortise plates. If you need rounded mortise plates you'll need to specify when ordering. There are certain Emtek locksets that will require different bore hole spacing that the standard American bore hole spacing for knobs and deadbolts. Any special requirements will be noted on the individual product page for that Emtek doorknob. These keyed locks with sideplates require two sets of holes with a center-to-center distance of 3-5/8" between the two sets of holes. Please watch for special notes on any of our door hardware product pages so that you don't order door knobs that are not going to work with your existing doors.